New applications of hydrogels draw growing attention to the development of tough hydrogels. Most tough hydrogels are designed through incorporating large energy dissipation from breaking sacrificial bonds. However, these hydrogels still fracture under prolonged cyclic loads with the presence of even small flaws. This paper presents a principle of flaw-insensitive hydrogels under both static and cyclic loads. The design aligns the polymer chains in a hydrogel at the molecular level to deflect a crack. To demonstrate this principle, a hydrogel of polyacrylamide and polyvinyl alcohol is prepared with aligned crystalline domains. When the hydrogel is stretched in the direction of alignment, an initial flaw deflects, propagates along the loading direction, peels off the material, and leaves the hydrogel flawless again. The hydrogel is insensitive to pre-existing flaws, even under more than ten thousand loading cycles. 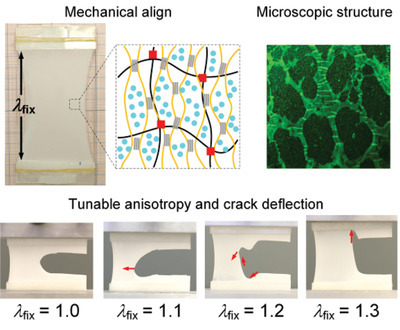 The critical degree of anisotropy to achieve crack deflection is quantified by experiments and fracture mechanics. The principle can be generalized to other hydrogel systems.